When using a public restroom, a top priority for many people is staying sanitary. No one wants to walk into a public bathroom stall and sit in someone else’s mess. It can be stressful for a lot of people to use a public toilet for this reason. Most notably, popular public attractions that draw crowds, and thus plenty of bathroom users, can be an issue for those who want to avoid germs. When a person goes to a public restroom, they want to use a clean toilet. Unfortunately, the standard paper public restroom toilet seat covers that are available in most venues can be less than helpful. They sit loosely on the toilet seat and can slide easily, increasing the risk of contact with the actual seat. What’s worse is that they are made of a thin paper almost like tissue paper, which fluids and messes can seep through and make contact with skin. Some patrons might even leave their covers on the seat for the next person to deal with, which is far less than preferable for sanitation-conscious bathroom users. With automatic toilet seat covers, a lot of stress can be alleviated from customers and clients. At busy venues such as parks, arcades, airports, casinos, and other popular attractions, those who are concerned about germs and sanitation may find going to the restroom to be a stressful event. They don’t want to contact the toilet seat, and they don’t want to have to touch the dirtier parts of facilities to try to correct the issue. 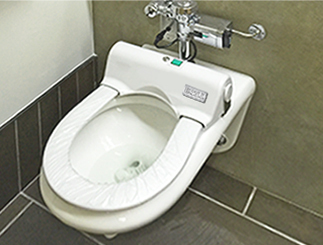 Our toilet seat cover system circumvents the need for restroom users to make contact with the toilet seat itself. With the simple wave of their hand near a motion sensor on the wall, a toilet seat cover will automatically be dispensed over the toilet seat in a hands-free automated process. They can also press a green button at the back of the toilet seat to automatically dispense the cover. We take our toilet seat covers and your customers’ sanitary concerns seriously. That’s why we personally ensure that our covers are the best by manufacturing them ourselves. We ensure the highest quality protective toilet seat covers by having their production in our own hands. We know exactly how important health and safety are to our clients, and our clients’ customers, so we take painstaking measures to deliver the absolute best quality. Our revolutionary product makes using public toilets a stress-free experience for every user. 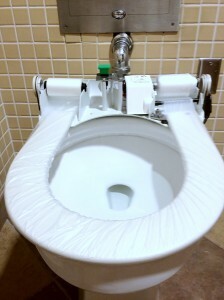 They don’t need to use their hands to put the seat cover in place, so they don’t have to worry about their hands making contacts with the germs or mess left behind by previous users. Many attendants at public attractions have so many concerns about using public venues that they may avoid going to the bathroom in public entirely. This can reduce venue traffic when peoples’ anxieties are such that they avoid going to public places for fear of using the restroom. When potential customers hear that your facility uses hands-free automatic toilet seat covers that increase their protection so much, they will feel much better about using your public restroom. This will encourage them to come to your venue even if they avoid others, and thus increase your traffic and ticket sales. We know that your customers’ health and satisfaction is important to you—and it’s important to us as well. That’s why we have made the effort to provide this revolutionary sanitation technology to our clients, with a product manufactured with the highest quality materials that we personally inspect to make sure we are delivering the best public bathroom toilet seat covers that money can buy. We also use American-made materials to make for a locally beneficial solution to all of your customers’ needs.